Editor’s note: Paolo Mottola is a finalist for 2017 Content Marketer of the Year. We will be sharing insight from all CMY finalists in the blog before the winner is announced at Content Marketing World this September. With Mark Zuckerberg recently identifying video as a “mega trend” with the same game-changing potential as mobile, the race is officially on for marketers to add video to their content mix. Consider REI out ahead of the pack, as its managing editor, Paolo Mottola, has long understood the inherent power of visual storytelling. His farsightedness means that his team is well ahead of the video adoption curve and already seeing outstanding results. REI produces dozens every year, ranging in complexity from five-minute how-to videos all the way up to 40-minute documentaries. 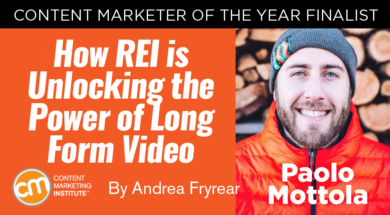 Paolo and his content marketing team are delivering real gains for the REI brand, earning enormous brand exposure and earned media with recent short films like Brothers of Climbing, Within Reach and Adventures in Real Life, which have received millions of views across digital networks in 2017. With video content firing on all cylinders, Paolo has earned a nomination for Content Marketer of the Year for 2017. And while REI has a uniquely powerful opportunity for producing amazing video, Paolo believes that any brand can reach its potential if it approaches video content the right way. REI’s brand is all about the outdoor lifestyle, and as the largest consumer co-op in America it’s blessed with an abundance of amazing stories to share. But even with this nearly ideal situation, REI didn’t rush into video production. The REI content marketing team built a video strategy from a solid foundation of internal brand guidelines and clearly defined brand voice. This base helps his team provide a consistent audience experience, whether showing viewers how to take their first snowshoeing trip or following expert cyclists biking across the United States. And, while Paolo and his team consistently get great outcomes from their video content, he keeps a critical eye on his content marketing strategy to make sure they’re telling stories in the right format. “The story needs to be conducive to video,” he reminds us. “You have to be honest and see how visual the subject will be and if motion is the best way to get the story out there.” Sometimes it will be, but other times long-form journalism, infographics, or a photo series will give the story a better voice. 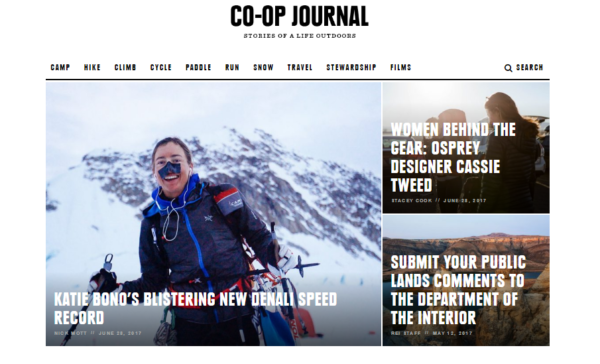 His teams deliver on those content formats, too, as demonstrated on the Co-op Journal, REI’s online publication. Once REI’s content marketing team decides video is truly the right approach, it starts to design and resource the story. For example, an internal creative team produces between 10 and 20 education videos each quarter, meeting a variety of needs in the consumer journey. These videos run about 3 to 5 minutes in length, each introducing people to the outdoor lifestyle or familiarizing them with specific outdoor gear or skills. They find a home in REI’s Expert Advice Library, the most popular content hub that REI produces. At the same time, Paolo’s team partners with external production companies to build a cadence of entertaining, aspirational stories that resonate with REI’s target audience. These are typically longer, running 10 and up to 40 minutes in length, and may take a full year to produce. If someone has never been camping and REI can show how to get started with confidence, that consumer will be more likely to come to REI when it’s time to make a purchase. These are the shorter, how-to videos that many marketers employ, and they deliver measurable changes in buyer behavior near the act of making a purchase. But when they extol the virtues of an outdoor lifestyle in a broad sense, Paolo and his team are practically working outside the sales funnel, he says. The documentary Paul’s Boots, which has over 1 million views since launching October 2016, follows the journey of a pair of boots whose owner hoped to hike the Appalachian Trail. He passed away before achieving the goal, but other hikers took up his boots to posthumously complete the trek. The film was produced in partnership with the Seattle-based filmmakers at Duct Tape Then Beer. It’s an inspirational, aspirational, long-form piece of content, but it’s increasing awareness of the REI brand for its target audience, producing a larger customer base for future content. For Paolo, this range of videos drives home the power of educating and entertaining simultaneously. His team is always working on both kinds of content, allowing them to deliver a steady stream of engaging video to audiences at various stages of the customer relationship. Paolo is part of a marketing team at REI that leverages agency and publisher relationships to co-develop stories and serve them to the right audiences. For instance, a recent collaboration with Gear Junkie has helped tell the story of a couple cycling across the country picking up garbage as they go. Gear Junkie produces content around the trip in a “Packing It Out” series, and REI hosts trash cleanups at their stores while showing how the couple’s tricks have allowed them to pack out hundreds of pounds of trash on their trips. Then there’s Teton Gravity Research (TGR), which is in the process of creating its 22nd annual ski film and producing an article-based web series with REI, Breaking Through, about outstanding women who are crushing it in action sports. REI is the title sponsor of the film and has event activations as part of a corresponding nationwide, experiential tour. “Partnerships like these allow REI to reach an expanded audience and deliver valuable content consistent with our brand,” Paolo says. Mediavest | Spark supports these partnerships for REI, and as video creators themselves, the REI team can come to the table as creative collaborators rather than as a dictatorial brand unfamiliar with the intricacies of content creation. Paolo recognizes he’s uniquely positioned as part of a co-op filled with members who are constantly doing amazing things outdoors, so he’s quick to encourage other marketers to take their own path, regardless of their industry or audience. When you deliver amazing content experiences like those that Paolo and his team produce, audiences respond with more purchases and far stronger brand loyalty. Don’t be afraid to spread your video efforts across the funnel and even outside its reach to help your audience members wherever they may be on their own personal journey. If you want to learn more about what the top marketers are doing, sign up for your free subscription to Chief Content Officer magazine. Make plans to attend Content Marketing World Sept. 5-8 in Cleveland, Ohio, to hear who wins Content Marketer of the Year 2017 and learn from industry experts so you may create an award-winning content marketing program yourself. Register and use code BLOG100 to save $100. Editor’s note: A special thanks to Ardath Albee who scoured the planet looking for the best-of-the-best content marketers. She was instrumental in helping us find our 2017 Content Marketer of the Year finalists.